The Alto Bonito Elementary 5th grade class traveled to San Antonio to visit the Witte Museum and the San Antonio Zoo to Learn About Science. With the Science TAKS test creeping up on them the teachers decided to give the students a different experience other than the traditional way of learning. They attended college like classes to learn about the water cycle, systems, ecology, states of matter and they even portrayed archeologists as they searched for dinosaur bones. The trip was fun and exciting as well as educational. 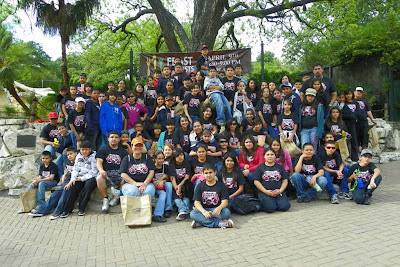 Pictured above are: The 5th the Grade class of 2010, along with their teachers, Ms. Linda Pena, Mrs. Jessica Tamez, Miss Jennifer Pena, Mr. Jose Hernandez and Mr. Demetrio Rodriguez.